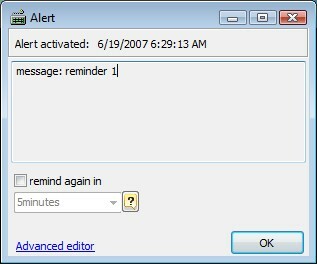 This section allows you to create notification alerts or scheduled tasks to be executed. These alerts can be one-off alerts or recurrent. a) as a fixed date / time. there and select "New alert". You can also have a reference url that will be displayed when the alert is activated. a) Run at: accepts a fixed date / time. or click on the yellow help button next to "Run in". 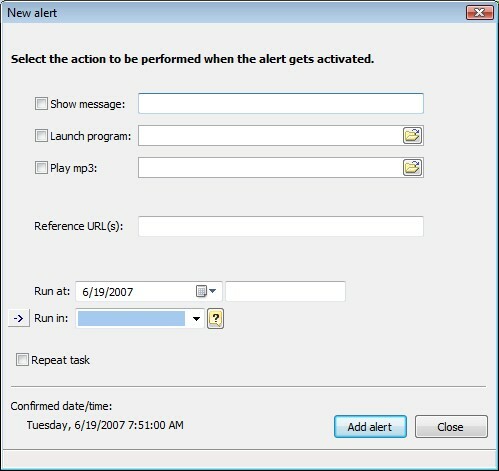 when an alert is supposed to be executed, this alert will be executed on the next program start. a selection from the "remind again in" dropdown list. b) time left: displays the time left in a friendly format.